Two-bedroomed Dionysos Villa is part of Dionysos village with a private pool, modern interiors and shrubbery-studded grounds. With a large outdoor swimming pool, lush green garden surroundings and beautiful, modern furnishings, ten-bedroomed Villa Turunc provides the perfect holiday or celebration villa for families. Five-bedroomed Villa Bitki boasts an unrivalled location in Turunc on the sheltered and sandy shore of the scenic Turkish Riviera. For a superbly comfortable and authentic Turkish experience, four-bedroomed Villa Selimiye is your go to. The classic cottage-style villa oozes rustic charm. Think stone walls. Zeytin Evi is a child-friendly three-bedroom villa that doesn't compromise on style or space. Set in-between pine tree-lined forests near Turkey's southwest coast. 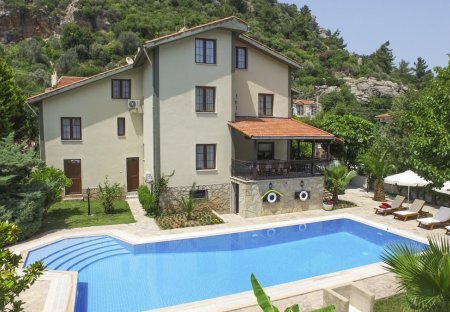 Muz Evi is an attractive one-bedroom villa in the rolling hills just outside the picturesque resort city of Marmaris in Turkey. Situated in a tranquil spot on the side of a valley. Rustic three-bedroomed Villa Gulseren offers a relaxing family-friendly retreat in a rural, unspoilt part of the Turkish Lycian Coast. For a peaceful and secluded holiday head to two-bedroomed villa Incir Evi near Marmaris in Turkey. Discover a beautiful part of rural Turkey at four-bedroomed Villa Kizkumu, a traditional rustic stone-built villa nestled in the sleepy village of Orhaniye. Cut into the hillside. For seafront serenity, one-bedroomed Orhaniye Plaj in this pretty seaside village just half an hour from the resort of Marmaris is an ideal choice. A FULL BOARD holiday with a difference for groups of 6 to 16 people. Instead of booking a villa this year, charter a traditional Turkish gulet complete with Captain and Crew. Children welcome too! The one bedroomed Dionysos Cottage a is part of Dionysos village with a private pool, modern interiors and shrubbery-studded grounds. Larger than many Turkish resorts, Marmaris is certainly well set up for tourists, with restaurants, bars and shops aplenty and a buzzing nightlife. The long pebbly beach is flanked by a wide seafront promenade, leading to the pretty harbour filled with luxurious yachts, and a stunning outlook over the bay. Despite its reputation as a modern resort, Marmaris does have an old quarter which includes an Ottoman castle, traditional houses, bazaars and old Turkish men playing backgammon in the maze of narrow cobbled streets. If you are looking for a beach holiday then Marmaris not only offers its own, and a plethora of associated water sports, but regular boat trips to beaches on secluded islands. There is also the nearby beach of Icmeler, surrounded by pine forests and slightly less frenetic than Marmaris, and the uncrowded sandy beaches of Turunc. If lazing about on the beach, or sunbathing by your holiday villa’s pool isn’t enough for you, then an array of day trips are easy to find; catamaran tours to Rhodes, boat trips to the Tombs of the Kings, visiting Turtle beach and much more.